Alexander Ilyich Yegorov or Egorov (Russian: Алекса́ндр Ильи́ч Его́ров, Alexandr Iljič Jegorov) (October 25 [O.S. 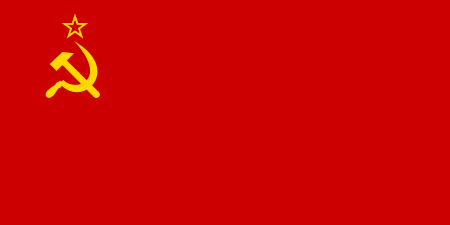 October 13] 1883 – February 22, 1939), was a Soviet military leader during the Russian Civil War, when he commanded the Red Army's Southern Front and played an important part in defeating the White forces in Ukraine. 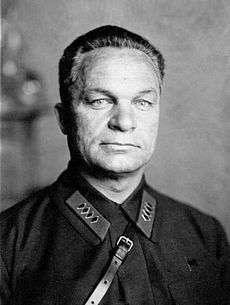 In 1920 Yegorov was one of the Red Army commanders during the Polish-Soviet War. In this campaign he was a close colleague of Stalin and of Semyon Budyonny. Yegorov was born into a peasant family near Samara in central Russia. 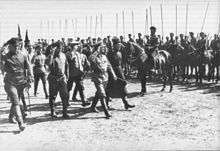 He joined the army of the Russian Empire in 1902 and qualified as an officer in 1905. As an army officer, he helped quell the Revolution of 1905. During World War I he rose to the rank of Lieutenenant-Colonel and was wounded five times. In 1904 he had joined the Socialist Revolutionary Party, but after the Bolsheviks took power (1917) he accepted the new régime and became a commander in the Red Army. Because of his old connections to Stalin and Budyonny, Yegorov seemed to be safe from the wave of arrests that swept through the Red Army in 1937 as Great Purge gathered pace. He was officially listed as one of the judges at Tukhachevsky's trial in June 1937. But at the end of 1937 he was demoted to Commander, Transcaucasian military district, and was arrested in February 1938 and his military writings banned. His downfall seems to have begun with a letter in the spring of 1937 from Combrig Fedor Sudakov of the Frunze Military Academy to Stalin questioning Yegorov's performance; a similar letter was sent by Combrig Yan Zhigur to Voroshilov on July 20, and Yegorov was further damaged by confessions extracted from officers arrested during the purge of the army. Yegorov died in prison. After Stalin's death (1953), Nikita Khrushchev rehabilitated the disgraced marshal. 1 2 Roy Medvedev, Let History Judge, 1971. ↑ Michael Parrish, Sacrifice of the Generals: Soviet Senior Officer Losses, 1939-1953 (Scarecrow Press, 2004: ISBN 0-8108-5009-5), p. 88.